Keco’s Heavy Duty Marine PumpOut trailers are manufactured to Department of Transportation (DOT) standards and are available with a Painted Steel or Galvanized finish. All trailers include pre-wired lighting and are available in a Single, Double or Triple axle configuration. Polyethylene tanks are available up to 1025-gallons and include Tank Level Markings and a Removable Man-Hole for Servicing or Inspection. 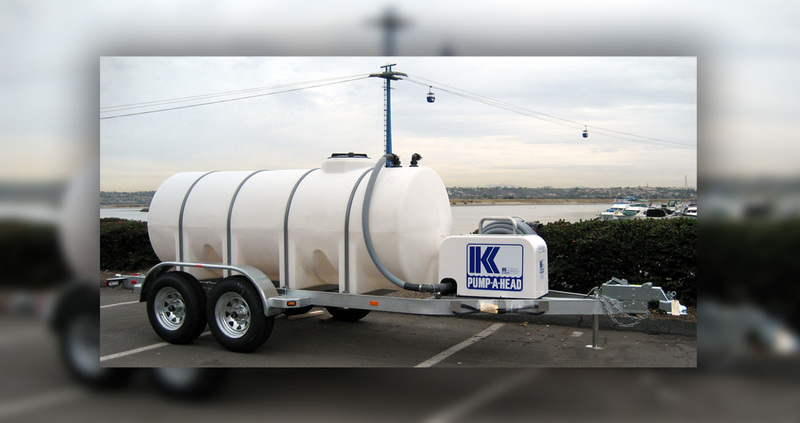 Keco’s PumpOut Trailers and Honeywagons are available in a variety of configurations. With an emphasis on Mobility, these Marine PumpOut trailers can be transported over a variety of terrains providing the ultimate convenience. Manufacturered for the Harshest Environments, Keco’s trailer systems are ideal for Marinas, Campgrounds, Dry Storage, Industrial Applications and RV Parks. Engineered frames and wash-down rated components ensure sanitary operation. Replaceable jack stands, heavy duty axles (single or double) and quick connect lighting reduce total cost of ownership. NEMA 4X electrical components (UL/CE Rated), 300 grade stainless steel fasteners and an available galvanized steel or epoxy / polyurethane protected aluminum frame make these units suitable for use in the harsh salt water environment. Offload using onboard pump, landside pumpout system or gravity drain. All models include quick connect fittings and connection hoses. All models are equipped with tank overfill protection with automatic pump shut down. 900 series models offer an additional layer of safety and include peristaltic pump leak detection and discharge system overpressure protection. Selecting the Right Pump is critical in ensuring years of trouble free operation. Site specifics such as Suction Length, Suction Lift, Discharge Length, Discharge Head, Hazardous Zoning, Power Supply, Projected Usage and Flow Rates should all be taken into consideration. Trailers can be outfitted with Diaphragm, Peristaltic and Vacuum pumps. Both Electric and Gasoline versions are available. Overfill protection is standard on most trailer models.